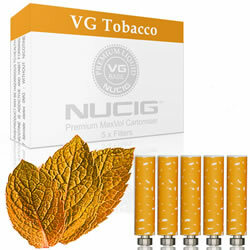 NUCIG® Tobacco Flavour MaxVol Filter Pack. VG base, proven to be smoother and kinder, amazing Maximum Volume 'smoke' / vapor. Same as upto 25 normal cigarettes. Available with and without nicotine. Strengths available in 24Mg, 18Mg, 12MG, 6Mg and ZERO content nicotine. Average Customer Review: 4.5 of 5 Total Reviews: 171 Write a review. Good product, excellent value, well packaged and delivered within 24hrs.